Every day women (and men!) take up the time honored pursuit of sewing. With the steady beat of the sewing machine, the fabric softly slipping under fingertips and endless fashion possibilities, what is there not to love? Sadly many give the pastime up because it becomes more of a frustration than a relaxation, a burden instead of a pleasure. Fear not! It’s all about progression – you can’t run before you learn to walk! Start with an sewing project for beginners, and work your way up. We thought it might be useful to highlight those of our styles better suited to beginners. Deciding what to sew is the first and most crucial step to achieving success in sewing. 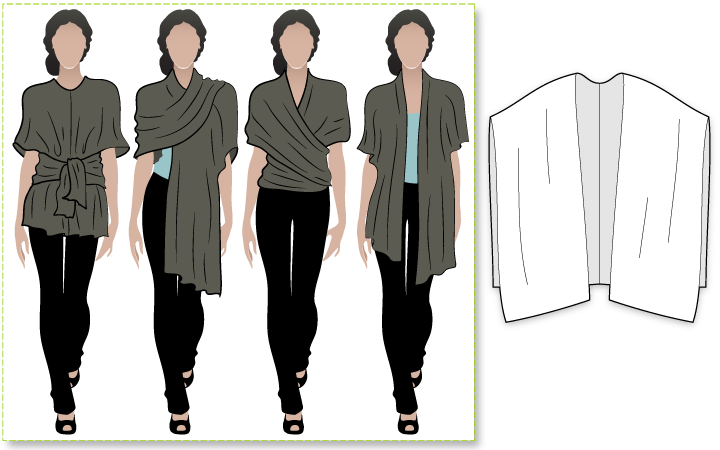 For absolute beginners, start out by picking perhaps our easiest sewing project, the Shirley Shrug. As simple to wear as it is to sew, it looks great with jeans or slipped over a dress while out on the town. We’re almost embarrassed selling patterns as simple as this – sure the design is clever but it’s really only two pattern pieces! The Bella Wrap is another super easy project to check out on this theme. Those looking for a little more of a challenge should consider a pattern like the Ollie Tunic. While being a very straight forward and simple top to make, it can fit almost any occasion through fabric choice. This top simply works over leggings (more on these later) and also looks great with a belt. For example, choose a classic jersey knit in teal with a white belt for a breezy beach vibe or maybe go for a vibrant and bright popping paisley knit with a black belt for an artsy coffee shop feel. This easy sewing project could well be your perfect canvas for creativity by trying a few simple embellishments! First and foremost, never feel bad about picking an easy sewing project. Even the most talented seamstresses and tailors pick simple projects for their classic and sleek designs. It is all about perspective! If you master the basics first then you will not only have a good foundation to build upon, you’ll have a great collection of clothing and accessories! Decide what you would like to work with. Choose fabrics that are not slippery, preferably with no nap (so you don’t need to worry about orientation); patterned fabrics are great but you may want to avoid the hassle of aligning the pattern pieces on a geometric print. Embellishments can turn into a friend or foe, belt loops and elastic waists are pretty simple to accomplish but steer clear of things like hidden zippers and gathered seams to start with! Look for and master straight lines; curved, zigzag and ruching are more difficult which can prove discouraging if the piece doesn’t come out as desired. Before beginning always completely read your instructions. Completely! I can’t stress this enough, you need to know where you are going AND how you are going to get there. Once you have read through the instructions you should clarify anything you are unsure on or confused about. If you can’t find what you are looking for on a tutorial, or it just doesn’t make sense, then try posting in a forum for personal guidance; most experienced sewers want to see other new sewers succeed and are usually willing to share their secrets. Don’t be scared to email us as well. We might not reply straight away, but we’re always happy to help – we want you to have a great experience with our sewing patterns. Get organised! Knowing where your tools are located is just as necessary as knowing what your tools do; sewing is no fun if you are frustrated because you can’t find your pins or scissors! Do some pre-project prep work. I find it is always easier to handle a project when I take the time to properly prepare my sewing pattern. Take the time to carefully cut your pattern out before pinning and cutting from the fabric, this will help you to avoid tearing or otherwise damaging your pattern. Try the same project more than once, especially if it turned out well the first time. Buy different fabrics and small embellishments, and give them a go as your confidence builds! Not only will you have a full wardrobe (or a few gifts!) you can easily track your own personal sewing progress. If this all feels a bit daunting, don’t be discouraged. 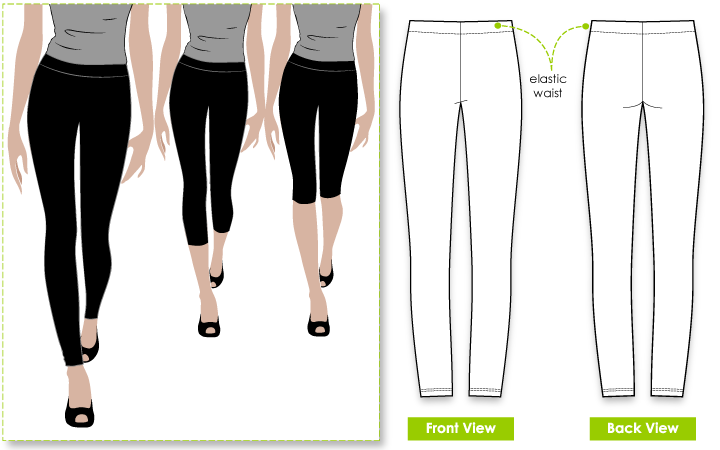 Try out a super simple pattern to start, a pair of leggings is incredibly simple to assemble and will prove so versatile you’ll want to make more. Palazzo pants are another great option if you would rather give something a little roomier a go. The goal is to pick something you will be comfortable sewing and wearing. Once you have completed a few easy sewing projects and you think that you are ready to advance to the next level, then try something like our Ursula or Gorgeous Gore Skirt. 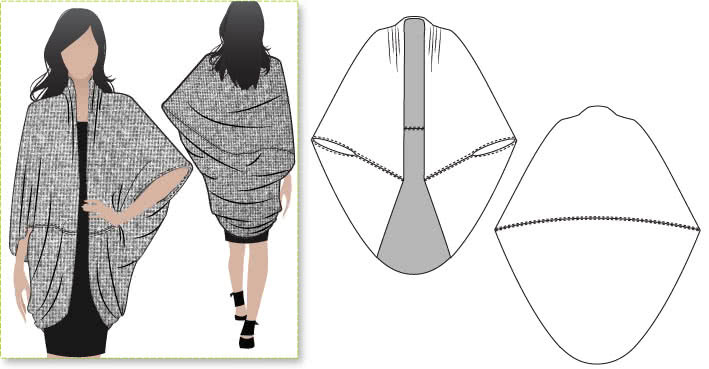 Although these patterns both remain relatively simple projects, a touch of complexity is added, with each skirt requiring either contrast panels or gores to be sewn. 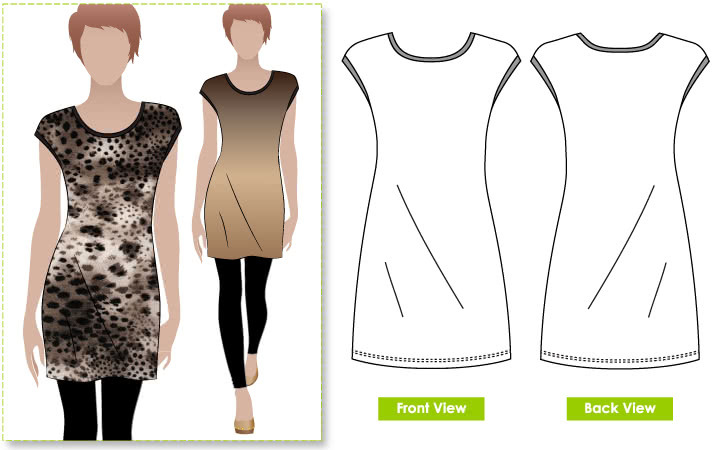 Other patterns to consider are the Fay Skirt, Riva Raglan or the Alannah T-shirt. Now that you have your easy sewing project picked and prepped, your tools and supplies organized and your wits prepared it is time to go sew! Don’t be shy to get in touch if you have any trouble!